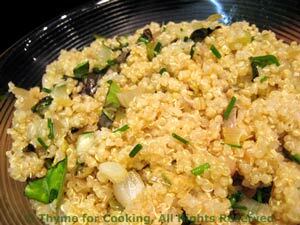 Shallots and Quinoa, Thyme for Cooking easy grain side dishes. This near-perfect food of the Incas has slowly been gaining recognition in the culinary world. It cooks quickly and has a nutty flavor that goes with everything. It is normally ready to cook, but if not it will need to be rinsed first. If you can't find it substitute Basmati or Jasmine Rice. Combine quinoa and stock in small saucepan. Cover and bring to a boil. Reduce heat and simmer until done, about 15 minutes. In small skillet heat 1 tbs olive oil. Add shallots and sauté until tender, about 5 minutes. Add herbs, lemon and stir into quinoa. Spoon into a serving dish and serve. Note: When using dried herbs add to quinoa with the stock, before cooking.